Book: In the Ranks of the C.I.V. 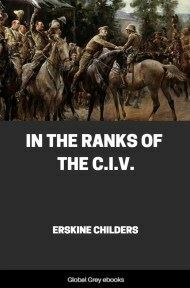 In the Ranks of the C. I. V., is an account of Erskine Childers' experiences in the Boer War. 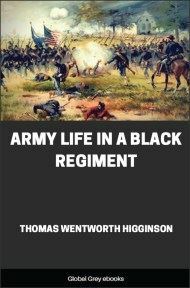 He wrote it without any thought of publication: while serving with the Honourable Artillery Company in southern Africa he composed many long, descriptive letters about his experiences to his two sisters. They, together with Elizabeth Thompson, daughter of George Smith of the publishing house Smith, Elder and a friend of the family, edited the letters into book form. With some who left for the War it was "roses, roses, all the way." For us, the scene was the square of St. John's Wood Barracks at 2 A.M. on the 3rd of February, a stormy winter's morning, with three inches of snow on the ground, and driving gusts of melting flakes lashing our faces. In utter silence the long lines of horses and cloaked riders filed out through the dimly-lit gateway and into the empty streets, and we were off at last on this long, strange journey to distant Africa. Six crowded weeks were behind us since the disastrous one of Colenso, and with it the news of the formation of the C.I.V., and the incorporation in that regiment of a battery to be supplied by the Honourable Artillery Company, with four quick-firing Vickers-Maxim guns. Then came the hurried run over from Ireland, the application for service, as a driver, the week of suspense, the joy of success, the brilliant scene of enlistment before the Lord Mayor, and the abrupt change one raw January morning from the ease and freedom of civilian life, to the rigours and serfdom of a soldier's. There followed a month of constant hard work, riding-drill, gun-drill, stable work, and every sort of manual labour, until the last details of the mobilization were complete, uniforms and kit received, the guns packed and despatched; and all that remained was to ride our horses to the Albert Docks; for our ship, the Montfort, was to sail at mid-day. Hardships had begun in earnest, for we had thirteen miles to ride in the falling snow, and our hands and feet were frozen. As we filed through the silent streets, an occasional knot of night-birds gave us a thin cheer, and once a policeman rushed at me, and wrung my hand, with a fervent "Safe home again!" Whitechapel was reached soon enough, but the Commercial Road, and the line of docks, seemed infinite. However, at six we had reached the ship, and lined up into a great shed, where we took off and gave up saddles and head-collars, put on canvas head-stalls, and then enjoyed an excellent breakfast, provided by some unknown benefactor. Next we embarked the horses by matted gangways (it took six men to heave my roan on board), and ranged them down below in their narrow stalls on the stable-deck. Thence we crowded still further down to the troop-deck—one large low-roofed room, edged with rows of mess-tables. My entire personal accommodation was a single iron hook in a beam. This was my wardrobe, chest of drawers, and an integral part of my bed; for from it swung the hammock. We were packed almost as thickly as the horses; and that is saying a great deal. The morning was spent in fatigue duties of all sorts, from which we snatched furtive moments with our friends on the crowded quay. For hours a stream of horses and mules poured up the gangways; for two other corps were to share the ship with us, the Oxfordshire Yeomanry and the Irish Hospital. At two the last farewells had been said, and we narrowed our thoughts once more to all the minutiæ of routine. As it turned out, we missed that tide, and did not start till two in the next morning; but I was oblivious of such a detail, having been made one of the two "stablemen" of my sub-division, a post which was to last for a week, and kept me in constant attendance on the horses down below; so that I might just as well have been in a very stuffy stable on shore, for all I saw of the run down Channel. My duty was to draw forage from the forward hold (a gloomy, giddy operation), be responsible with my mate for the watering of all the horses in my sub-division—thirty in number, for preparing their feeds and "haying up" three times a day, and for keeping our section of the stable-deck swept and clean. We started with very fine weather, and soon fell into our new life, with, for me at least, a strange absence of any sense of transition. The sea-life joined naturally on to the barrack-life. Both are a constant round of engrossing duties, in which one has no time to feel new departures. The transition had come earlier, with the first day in barracks, and, indeed, was as great and sudden a change, mentally and physically, as one could possibly conceive. On the material side it was sharp enough; but the mental change was stranger still. There was no perspective left; no planning of the future, no questioning of the present; none of that free play of mind and will with which we order our lives at home; instead, utter abandonment to superior wills, one's only concern the present point of time and the moment's duty, whatever it might be. The trumpet blew reveillé at six, and called us to early "stables," when the horses were fed and watered, and forage drawn. Breakfast was at seven: the food rough, but generally good. We were split up into messes of about fourteen, each of which elected two "mess orderlies," who drew the rations, washed up, swept the troop-deck, and were excused all other duties. I, and my friend Gunner Basil Williams, a colleague in my office at home, were together in the same mess. Coffee, bread and butter, and something of a dubious, hashy nature, were generally the fare at breakfast. I, as stableman, was constantly with the horses, but for the rest the next event was morning stables, about nine o'clock, which was a long and tedious business. The horses would be taken out of their stalls, and half of us would lead them round the stable-deck for exercise, while the rest took out the partitions and cleaned the stalls. 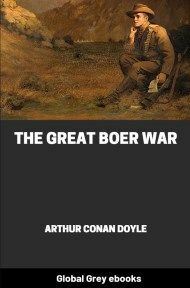 Then ensued exciting scenes in getting them back again, an operation that most would not agree to without violent compulsion—and small blame to the poor brutes. It used to take our whole sub-division to shove my roan in. Each driver has two horses. My dun was a peaceful beast, but the roan was a by-word in the sub-division. When all was finished, and the horses fed and watered, it would be near 12.30, which was the dinner-hour. Some afternoons were free, but generally there would be more exercising and stall-cleaning, followed by the afternoon feeds and watering. At six came tea, and then all hands, including us stablemen, were free.